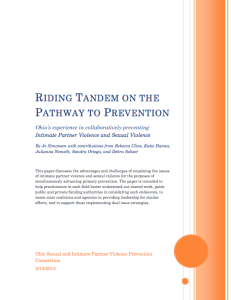 Recently, the Ohio Sexual and Intimate Partner Violence Prevention Consortium released the concept paper, Riding tandem on the pathway to prevention: Ohio’s experience in collaboratively prevention Intimate Partner Violence and Sexual Violence. The paper discusses the advantages and challenges of conjoining the issues of intimate partner violence and sexual violence for the purposes of simultaneously advancing primary prevention. In this podcast, Jo Simonsen and Rebecca Cline from Ohio Domestic Violence Network, Debra Seltzer from Ohio Department of Health, and Katie Hanna from Ohio Alliance to End Sexual Violence discuss the paper and their experience and perspectives regarding cross collaboration. Listen below.